French cosmonaut. Mission to swap Soyuz lifeboats docked to station. AKA: Derbent;ISS EP-2;ISS-3S;Soyuz TM-33. Launched: 2001-10-21. Returned: 2001-10-31. Number crew: 3 . Duration: 9.83 days. Soyuz TM-33, an ISS lifeboat, carried two Russian and one French cosmonaut to the International Space Station (ISS). It docked with the ISS at 10:00 UT on 23 October. This new crew spent eight days on the ISS, and returned on the older Soyuz TM-32 at 03:59 UT on 31 October. The new Soyuz was to remain docked as a lifeboat craft for the long-term ISS crew of three (two Russian and one American) astronauts. 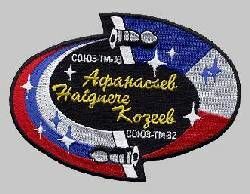 On May 5, 2002, after a week aboard the station, the visiting Soyuz TM-34 crew moved to the old Soyuz TM-33, docked at the Pirs port. They undocked at 0031:08 UTC on May 5, leaving the EO-4 crew of Onufrienko, Walz and Bursch with the new Soyuz TM-34 as their rescue vehicle. Soyuz TM-33 made its deorbit burn at 0257 UTC and landed successfully at 0352 UTC 25 km SE of Arkalyk. More at: Soyuz TM-33 ISS EP-2. Family: Manned spaceflight. People: Afanasyev, Andre-Deshays, Kozeyev. Spacecraft: Soyuz TM. 2001 October 21 - . 2001 October 21 - . 08:59 GMT - . Launch Site: Baikonur. Launch Complex: Baikonur LC1. LV Family: R-7. Launch Vehicle: Soyuz-U-PVB. Soyuz TM-33 - . Call Sign: Derbent. Crew: Afanasyev, Andre-Deshays, Kozeyev. Payload: Soyuz TM s/n 207. Mass: 6,750 kg (14,880 lb). Nation: Russia. Related Persons: Afanasyev, Andre-Deshays, Kozeyev. Agency: RAKA. Manufacturer: Korolev bureau. Program: ISS. Class: Manned. Type: Manned spacecraft. Flight: Soyuz TM-33 ISS EP-2. Spacecraft Bus: Soyuz. Spacecraft: Soyuz TM. Duration: 195.79 days. Decay Date: 2002-05-05 . USAF Sat Cat: 26955 . COSPAR: 2001-048A. Apogee: 397 km (246 mi). Perigee: 386 km (239 mi). Inclination: 51.60 deg. Period: 92.40 min. Soyuz TM-33, an ISS lifeboat, carried two Russian and one French cosmonaut to the International Space Station (ISS). It docked with the ISS at 10:00 UT on 23 October. This new crew spent eight days on the ISS, and returned on the older Soyuz TM-32 at 03:59 UT on 31 October. The new Soyuz was to remain docked as a lifeboat craft for the long-term ISS crew of three (two Russian and one American) astronauts. On May 5, 2002, after a week aboard the station, the visting Soyuz TM-34 crew moved to the old Soyuz TM-33, docked at the Pirs port. They undocked at 0031:08 UTC on May 5, leaving the EO-4 crew of Onufrienko, Walz and Bursch with the new Soyuz TM-34 as their rescue vehicle. Soyuz TM-33 made its deorbit burn at 0257 UTC and landed successfully at 0352 UTC 25 km SE of Arkalyk. 2001 October 23 - . 2001 October 30 - . ISS Status Report: ISS 01-41 - . Nation: USA. Related Persons: Afanasyev, Culbertson, Dezhurov, Tyurin. Program: ISS. Flight: Soyuz TM-33 ISS EP-2, STS-105 ISS EO-3. 2001 October 31 - . Landing of Soyuz TM-32 - . Return Crew: Afanasyev, Andre-Deshays, Kozeyev. Nation: Russia. Related Persons: Afanasyev, Andre-Deshays, Kozeyev. Program: ISS. Flight: Soyuz TM-33 ISS EP-2. The EP-2 crew - Afanasyev, Kozeyev and Andre-Deshays - undocked Soyuz TM-32 from the Pirs module at 01:38:30 GMT on October 31. The deorbit burn was at 04:04 GMT, with landing 180 km southeast of Dzhezkazgan at 04:59:26 GMT. This left the Expedition-3 crew of Culbertston, Dezhurov and Tyurin with Soyuz TM-33, docked with the Zarya module, as the station lifeboat.